It’s time to tune up your business intelligence. It’s Time To Upgrade Business Intelligence To Systems Of Insight, July 2015, Forrester Research. Find out why previous-generation BI needs a tuneup, and how systems of insight can help move your company into the future. 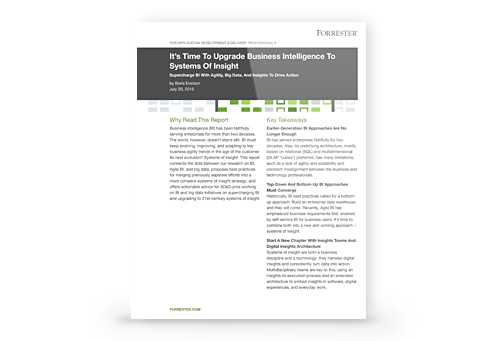 This Forrester report offers best practices for merging your legacy BI efforts into a cohesive system of insight strategy, and provides actionable advice on supercharging and upgrading your business intelligence.